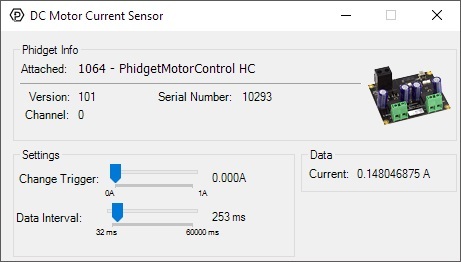 Replaced by the 1064_1B - PhidgetMotorControl HC. It is the exact same device, but you can now choose which USB cable you want to have included. 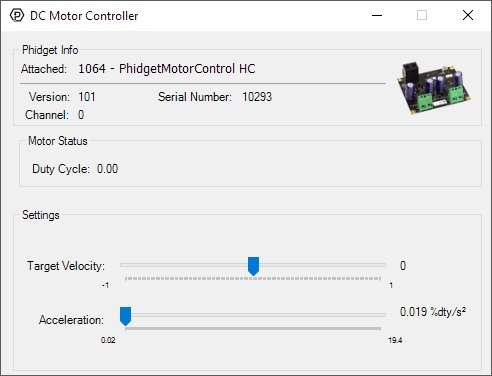 The PhidgetMotorControl HC allows you to control the angular velocity and acceleration of up to two high-current DC motors. 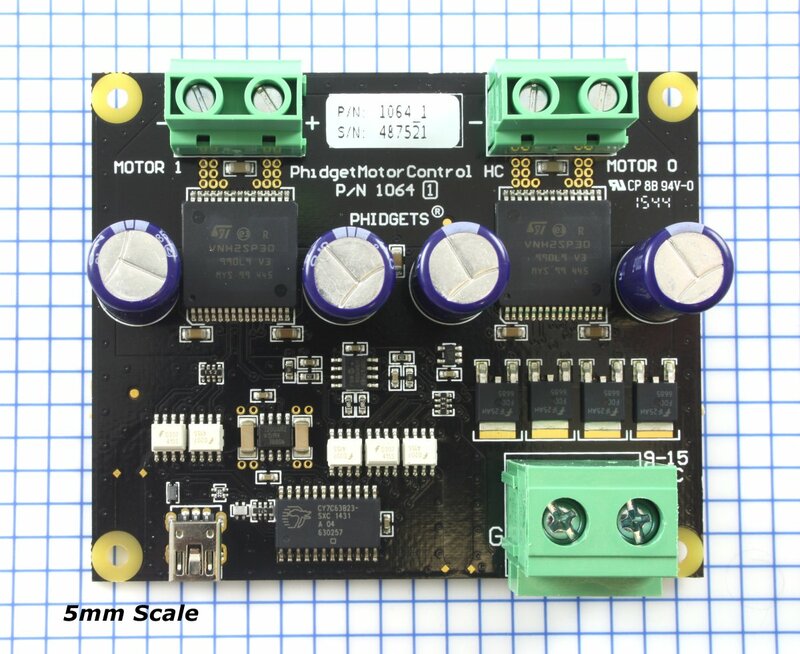 Many variations of brushed DC motors exist: permanent magnet motors, electromagnet motors, coreless motors, linear motors... the PhidgetMotorController can be used with any of these. These DC motors all have encoders attached to the rear shaft, allowing for closed-loop position control of your motor. In addition to the 1064 that drives the motor, you'll also need an encoder interface to read the encoder. If you're using an encoder, you may want to visit the "Other Controllers" tab and select a motor controller that has an encoder input built-in instead of the 1064. Linear actuators are simply DC motors that are hooked up to a linear screw which causes the shaft to move laterally instead of rotating. Unlike a rotary DC motor, linear actuators have a minimum and maximum position at which the shaft cannot contract or extend any further. On its own, the motor would not be smart enough to stop before attempting to push beyond these limits, possibly damaging the motor. That's why each linear actuator also has a built-in feedback potentiometer so you can monitor the position of the shaft and prevent the actuator from stalling out at its limits. The potentiometer can be read by any Phidget with an analog input. This Phidget requires a power supply between 6 and 15V DC. 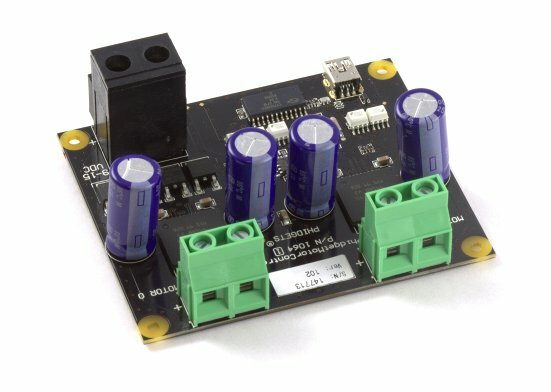 We recommend that you use a 12V DC power supply for best results. 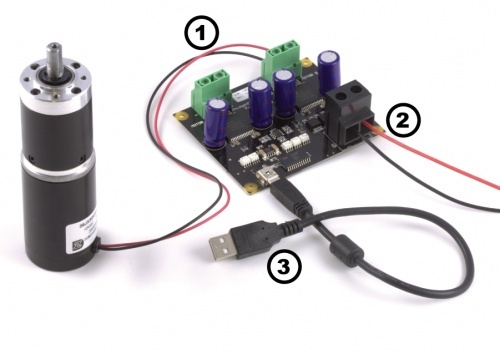 The amount of current required depends on how much current you expect each servo to use. If you plan on running two motors at once, you should get a 5 amp supply. Select the power supply from the list below that matches your region's wall socket type.